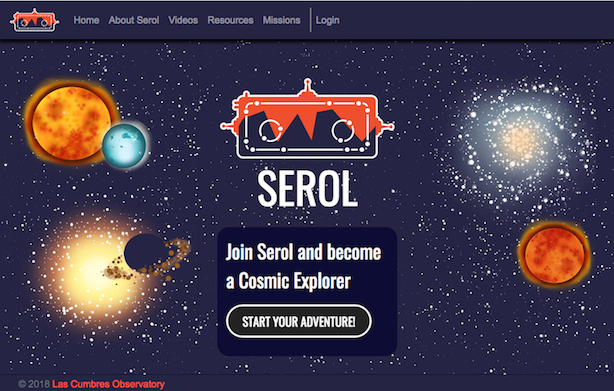 We’ve created a dedicated website called Serol’s Cosmic Explorers that uses robotic telescopes takes students on a journey to become a real cosmic explorer! Serol invites children to practise scientific skills while learning about our place in the Universe and leaning about the wonders of the cosmos. Throughout their journey, students will use the Las Cumbres Observatory’s robotic telescopes to collect data from a variety of cosmic objects, before being challenged to analyse, investigate and drawing conclusions about their targets. For every challenge you complete, students will earn an exclusive badge to prove they’ve mastered a new skill and gone up a level on the way to becoming a cosmic explorer. To conquer a mission, you’ll need to collect all five challenge badges, you’ll then be awarded one of three unique mission patches. To take part we recommend scheduling around 10-minutes at the start or end of a lesson once or twice a week. This time can be used to complete one or two tasks. The tasks should be completed at the front of the class, with them contributing as a group. Serol’s Cosmic Explorers is a resource designed based on teacher feedback throughout the 4-year Universe in the Classroom programme. The resources are designed for you, with your comments in mind, so please contact us with your feedback at [email protected].